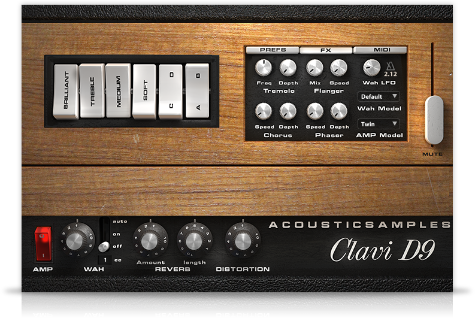 Clavi D9 by Acousticsamples is a Virtual Instrument Audio Plugin. It includes, and is therefore "powered by", UVI Workstation, which functions as a VST Plugin, an Audio Units Plugin and an AAX Plugin. The Clavi D9 is based on the well-known Clavinet D6 by Hohner. The original D6 has very few controls, 4 eq switches and 2 pickup switches to choose which pickup has to be used, along with a global volume. Acousticsamples recorded both pickups and modeled precisely the eqs. As a result you can use the white switches exactly like on the real instrument. Acousticsamples sampled every possible aspect of the instrument, regular notes, staccatos, releases, mutes, every pickup, sympathetic resonances and more to provide you with the most authentic Clavinet sound possible. The Clavinet was built to replace the guitars in Funk music. This is why most players mostly use very short notes. Acousticsamples thought of that when sampling the instrument and was able to reproduce it very accurately using a combination of staccato samples and longer release samples. The sympathetic resonance Acousticsamples modeled is sample based and very close to the real instrument. The Clavinet originally has two pickups, one next to the bridge that has a very bright sound and another one closer to the center of the string that has more bass. You can mix them using the switches, just like on the real instrument. We even added a possibility that is not in the original instrument, you can control the volume of each pickup separately in the preferences to really reach every possible sound when mixing both pickups. A Clavinet is almost always played with a Wah on it and is always amped, this is why the Clavi D6 has an included Wah effect that you can control with any controller and a few different amp simulations. The four switches (which could be named 4 band EQ) have been carefully modeled to be as close as possible to the original ones. Acousticsamples also included the most common effects used with a Clavinet: a spring reverb, a distortion, a tremolo, a flanger, a chorus and a phaser. Each of these effects have two controls on the interface. 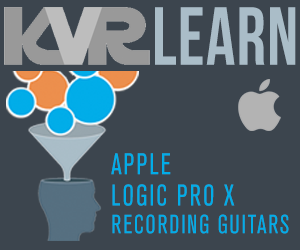 For more info, audio demos and videos, just visit the products page.